Animals are easily frightened by moving motor vehicles. If you’re approaching horses keep your speed down and watch to see if the rider has any difficulty keeping control. Always be ready to stop if necessary. 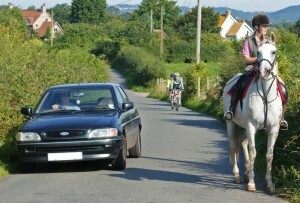 Always assume that the horse hasn’t seen you coming; it might have blinkers on and your vehicle will be hidden. The horse’s head and the rider create a blind spot for the horse, too. Modern cars are often very quiet and it can be easy to get quite close to a horse and rider before the rider or horse realises that the car is there. Once you are passed the horse, don’t use harsh, noisy acceleration as this can frighten the horse. If your vehicle has a loud stereo, turn it down before you get to the horse. If your vehicle has other noisy additions such as a sports exhaust or blow-off valve for a turbo, take extra care. On roundabouts, horse riders keep to the left within the roundabout until they reach their exit – pay attention to the rider’s hand signals.